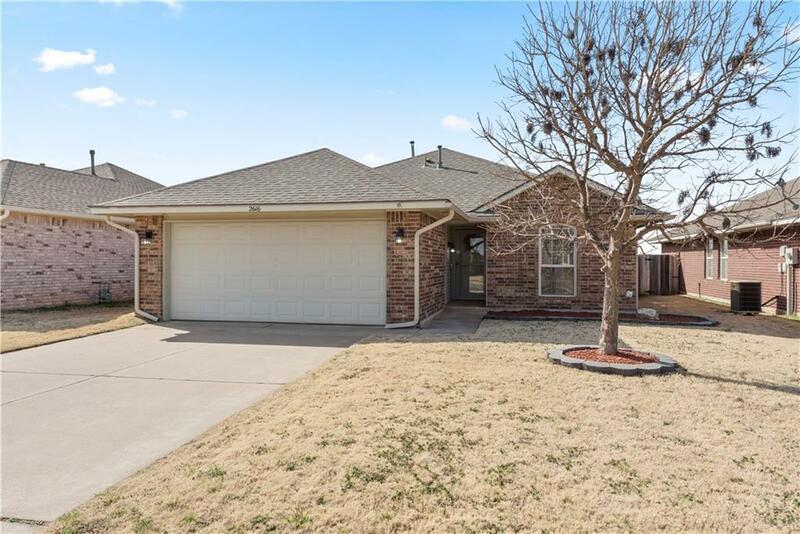 2616 Northern Hills Road, Norman, OK.| MLS# 852893 | Oklahoma City Real Estate | Apple Realty, Inc.
Adorable three bedroom, 2 bath home with fireplace, and 2 car garage. Brand new HVAC January 2019. Large living area with vaulted ceiling & cozy fireplace. Lovely window seat in dining area and room for bar stools at breakfast bar. Wood laminate flooring in kitchen and hallway. The master suite is bright and airy and features a vaulted ceiling, private bath & a large walk-in closet. Secondary bedrooms are spacious and have great closet space. Refrigerator, washer & dryer stays. New storm door on front door. Great storage throughout. Nice backyard with covered patio. Roof 2015. Two blocks from park.Relax by the peaceful pond, large city park with walking trail and basketball court for family enjoyment. So convenient to everything. Located minutes from I-35, OU and downtown Norman - yet has the country feel by being on the north edge of Norman. Very close to all amenities - many new shops, restaurants & businesses are close by. Don't miss out on this one!